Bella Vista Italian Kitchen and Bar has CLOSED! Bella Vista Italian Kitchen and Bar is the newest eatery in Aptos. It’s located in the famous Bayview Hotel, in Aptos Village. The Bayview Hotel has hosted a number of restaurants in recent years, but Bella Vista is under distinct ownership and management. It first opened its doors in late February 2017, and it quickly won accolades from many Aptosians looking for traditional and authentic Italian cuisine. The interior of the restaurant was completely refreshed for Bella Vista – it’s a transformation. The design is clean and classic 19th century; the feeling is warm and inviting, which is exactly how Johnson describes her reception by the local community. She attests that even competing restauranteurs in the area have been supportive. The chef is a native of Italy, hailing from Napoli. He’s worked in restaurants throughout the world and all over California. He is dedicated to his craft; he hand-rolls the gnocchi and and rolls and stuffs the ravioli by hand too. 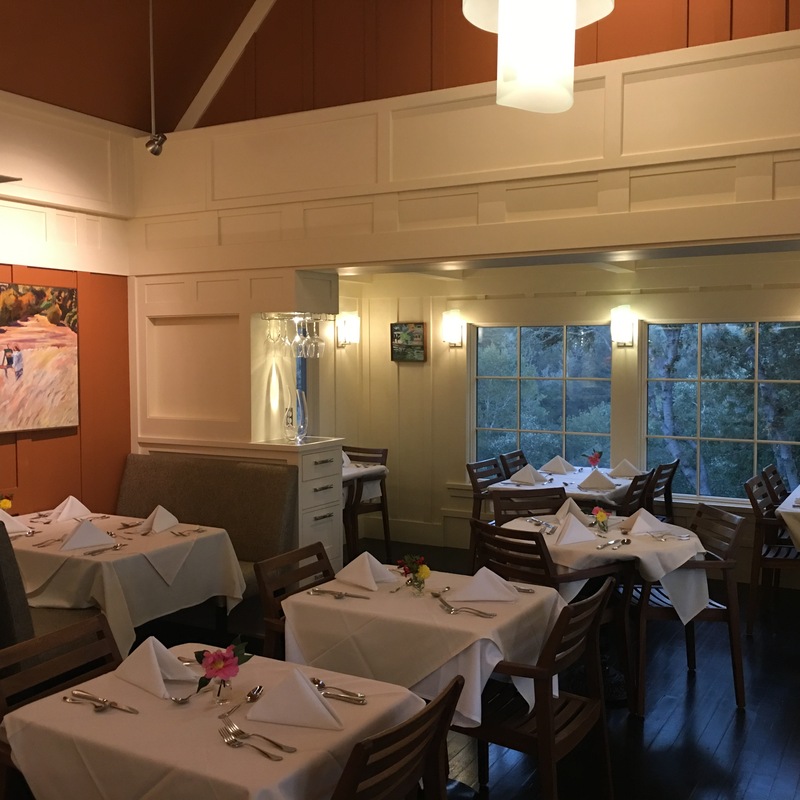 The wine list – featuring wines from Italy and California (mostly on the central coast) – was prepared by the head waiter Sandro, the former owner of Star Bene and Ristorante Da Mario in Saratoga. Bob Marsh, who runs the the local Birichino winery whose wines are featured, also helped with the wine list. The restaurant has a Mugnaini wood-fired clay oven in the back yard, which they use for braising their own meats…and for making pizza as well. The pizza uses caputo flour from Italy, which gives their hand-tossed crust a very distinctive flavor. They have live music every Friday night, and other musicians may drop by on other nights of the week to strike up a tune. Bella Vista Italian Kitchen and Bar is a huge and very refreshing departure from recent restaurants located within the Bayview. It’s got all the makings of a great spot for date night. 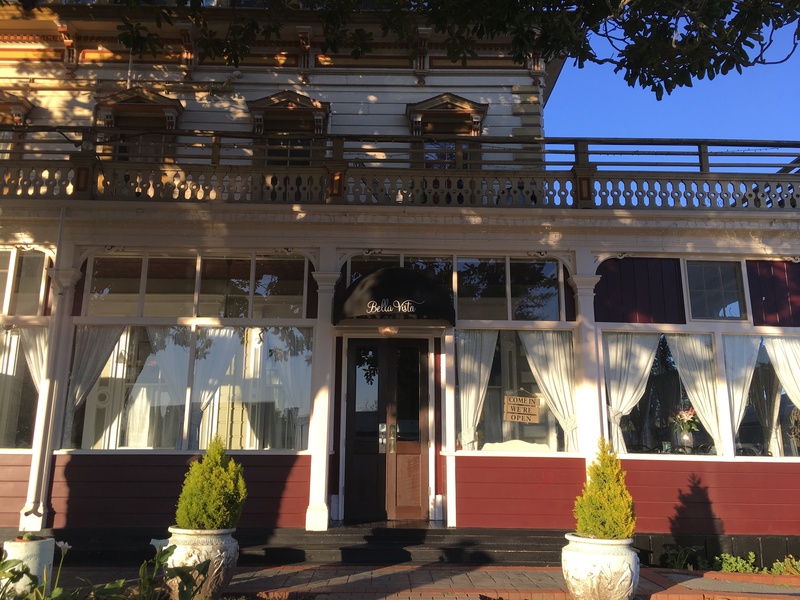 If you’re looking for something new and exciting to try in Aptos, take a step back in time and check out the new Bella Vista. I recently had an opportunity to chat with two of the owners of Persephone, the hottest new restaurant in Aptos. I wanted to check in with them and see how their new venture is going, and to learn more about what has made Persephone such a success right out of the gate. I sat down with chef Cori Goudge-Ayer and her brother Alex Potter who serves as the beverage manager / sommelier. I met with them around mid-day, as they were hard at work planning that evening’s service. Several cooks were in the kitchen, busily preparing the food which would be served in a few hours. I was told that the kitchen starts going shortly after dawn, as many of their dishes require hours of preparation. Speaking with Cori and Alex, their passion for their work and Persephone came through. I’m not a restauranteur and only a wannabe foodie, but when I have my choice, I want someone who clearly wants to serve a meal that’s going to knock my socks off. Talking to Cori and Alex, that’s the distinct impression I got: they want every dish that comes out of the kitchen to wow the palette and dazzle the eyes. One of Persephone’s hallmarks is their commitment to using fresh, seasonal, and locally sourced ingredients whenever possible. This means that the menu is always changing as new vegetables come into season. A couple of local farms have even agreed to grow vegetables exclusively for the restaurant, assuring them a steady supply of fresh, high-quality ingredients for their cuisine. This kind of dedication to their craft is clearly what’s behind the restaurant’s success. Already, a number of locals come to eat there on a weekly basis, as the daily and desert specials are constantly refreshed, subject to availability of ingredients. For example, many seafood items will be available only when the fishermen bring in a fresh catch, and may be on the menu for a single night only. If you’re looking to treat yourself (or your spouse, friends, or family!) to a really special night out, be sure to check out Persephone and see for yourself why they’ve already earned so many raving fans. The lower end of the Rancho del Mar Shopping Center is turning into a veritable ghost town, as another of its tenants have closed up shop. Early this month, the Kentucky Fried Chicken restaurant shut its doors, with apparently no prior notice to any of their customers. The plastic lighted sign has been turned around, and the letters and logo can be seen as a reversed ghostly image in the sign post. A note taped to the door gives thanks for “many years of patronage” and refers customers to two nearby KFC locations. Nobody seems to know precisely why the Colonel has left the building – but it seems the most likely reason is that their lease was up and the new owners of the shopping center raised the rate to the point where business at the location was no longer viable. A lot of folks will say good riddance to bad rubbish – but what comes next? The owner of Rancho del Mar, TRC (formerly known as Terramar Retail Centers), isn’t talking. We’ll just have to watch that space and see what pops up. 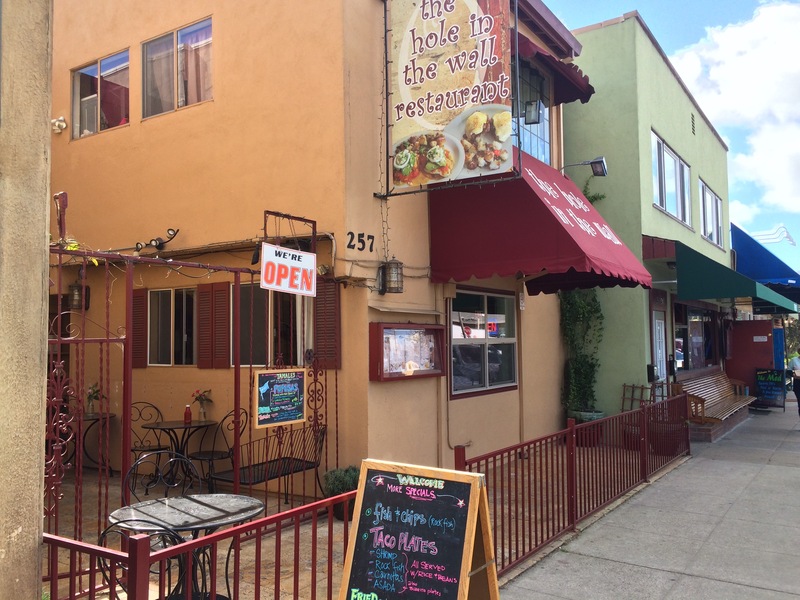 The Hole in the Wall Cafe is located in Seacliff Village, right on Center street and next to a number of other popular Aptos eateries. It’s called the Hole in the Wall for a reason: indoor seating is very limited, and outdoor seating isn’t too spacious, either. If you come for breakfast on a weekend, don’t be surprised if you have to wait in line. Some folks have commented on the service, saying that it can be bad at times, but that seems to coincide with their busiest hours. If there’s a line and the place is hopping, it’s best to allow some extra time for breakfast. They serve a wide range of American style breakfast foods, but also specialize in pupusas, as the owners are from El Salvador. They also offer beer and wine – the mimosas might seen expensive, but they’re served in a gigantic goblet and one will probably do the trick. They have recently started to open for dinner as well. All in all, the Hole in the Wall Cafe is a great place to grab breakfast or lunch in Aptos – just don’t come if you’re in a rush. Manuel’s Mexican Restaurant, located in the Seacliff neighborhood of Aptos, is practically an institution. They first opened their doors in 1965, and have been family owned and busy ever since. They have a traditional Mexican menu with a full bar, beer, and wine. Every meal is of course served with bottomless chips and Manuel’s salsa, the ingredient list for which is a trade secret. They have a lunch special every weekday from 11:30 AM until 3:00 PM, and they’re open seven days per week. When going to Manuel’s, you have the opportunity to really make a day (or night!) of it. The restaurant is located in the heart of Seacliff Village, just steps from the entrance to Seacliff Beach. It’s right across the street from Marianne’s Ice Cream in Aptos, and located right next door to the Mediterranean, the fabled Aptos watering hole.